We’re all about Brisket, Ribs, Chicken and Fish. Featuring melt in the mouth, “low and slow” authentic barbecue cooked in our Hard Wood Pit Smoker (all the way from the USA) and a Lump Wood Charcoal Oven. Check back with us to find out more as the menu rolls out and, if you’re a “Facebook’er” follow us for updates. We've been coming to your restaurant in both its guises for several years now. We noticed a distinct change in the menu and the food served this year. We ate with you this week on Sunday night; the 14th. The menu appears to be very reduced, there were no specials on the board or offered by the waiting staff (who were very attentive I must add). I had the rack of ribs which appeared to be smaller than last year and was overcooked/dry. My wife had the king prawn salad which at circa £16/17 was ridiculously priced. it came on a very wet salad that other people in our party had for free with their mains. To charge this for a handful of prawns is not acceptable. The table that we reserved wasn't ready when we came; you weren't that busy, so we sat in a different booth. Overall I felt the value proposition that you've offered in the last few years has really diminished. You appear to have cut several corners with your menu and quality of food to increase margins? We love your venue and hope that you can get back on track with a wider choice (ala last year) of food/specials and that the presentation improves. Great food would definitely dine here again!!!! Great food and great location, staff were friendly and helpful. Nice selection of meat and sides. Very nice place. Food was good. Definitely worth a visit. Only thing I wasn't sold on was kitchen roll instead if napkins. Everything else was great. The food was superb and good quality and good portions. Compliments to the chef. Value for money. The burnt ends in particular were amazing! We were a party of 12 and unfortunately we had to wait over an hour for food despite pre-booking. The San Miguel was warm, however the draught beer was better. Very disapponting rack of ribs which had to be sent back as unedible, we were unable to even pull them apart. When we spoke to the member of staff, they offered an exchange, however, they said there would be a long wait so therefore we said we would leave it. The other ribs as part of the 2 and 2 menu were overcooked and burnt. Overall, a very disappointing experience in terms of the ribs. Other members of our party had fish and said this was far better! Every time we go down to Saundersfoot we eat at  The beachside bbq restaurant and we enjoy every meal this is our 4th year in a row to eat on New Year’s Day after the swim and the service this year and meals were 1st class we are in catering our selves so know what it’s like at busy times well done and have a great 2019. Food when it eventually arrived was inedible one of the worst meals I've ever had not just myself but all ten guests were of the same opinion. This was absolutely incredible - genuinely the burnt ends starter was life-changing! I have already started encouraging friends and relatives to holiday in Wales just to try the immense smokey barbecue flavours on offer here. Any customer will not be disappointed! We booked a table and arrived half an hour  early (with two kids in tow, we're either half hour early or half hour late!) and the restaurant we're happy to accommodate as there was a table free. The portions we're big and staff were friendly. We weren't told about the fish species on the boards which was a shame - we noticed them after ordering. I went for the beef burger and added cheese - I have to say, I thought £1.50 for extra cheese was a bit of a con for what I had. I also felt the side salad was just leaves. For £13.50, I expected more, I'm afraid. If I went there again, I would go in daylight as I think the view would add to the atmosphere and would go for a platter and check out the fish. Location and views are amazing which is why we chose to visit. Couldn’t smell any of the barbecue food as described in the restaurant. Food in my estimation seemed to be from frozen. Cheese cake wasn’t as good as Tesco’s. Disappointed really. 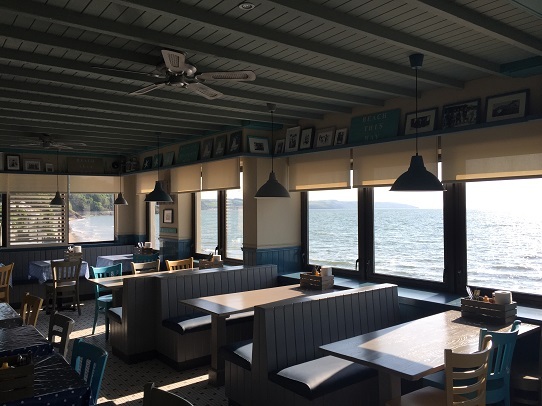 Great range of tasty food for a big family group with stunning views from the round table overlooking the beach. Lovely lunchtime meal out with family. Great setting overlooking the beach. Nice menu, meat focused obviously, but a shame that certain things unavailable, and quite limited fish options. Food was excellent. Overall a very enjoyable lunch. 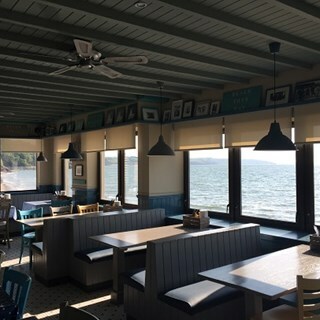 A table over looking the sea, perfect weather, a beautiful view and amazing food. What could be better? Really lovely staff, Sara the trainee was very efficient and seemed to genuinely enjoy her job. Friendly ‘buzzing’ atmosphere, wished we’d discovered this restaurant at the beginning of our holiday and not on the last day . The view was spectacular as the sun set. Thank you for a lovely meal. Menu was better in previous years. Brought the wrong wine initially but in all fairness corrected this when queried. Forgot to tell us about the specials on offer. Food was tasty but could have done with a little more brisket and burnt ends.